Vollrath 97140 Stainless Steel 3 Shelf Utility Cart - 39 1/2" x 21" x 33 1/4"
39 1/2" x 21" x 33 1/4"
27 1/2" x 15 1/2" x 32 5/8"
30 1/2" x 18 1/2" x 32"
30 7/8" x 17 3/4" x 33 3/4"
Transport heavy loads of food, dishes, or supplies with the Vollrath 97140 extra heavy-duty stainless steel three shelf utility cart! 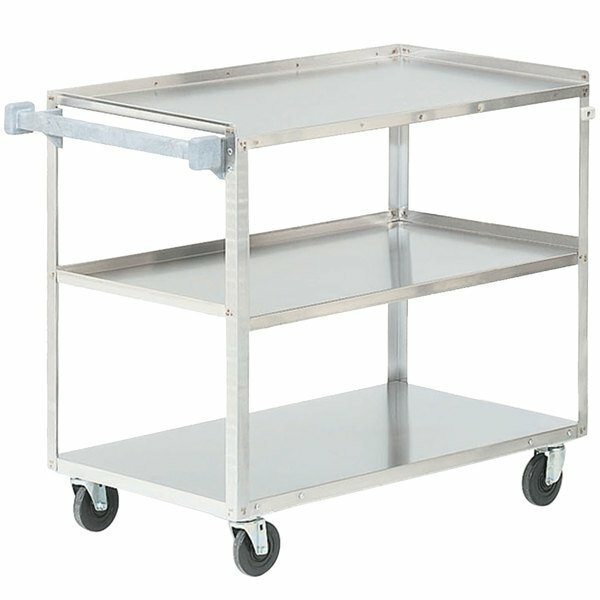 Perfect for use in your restaurant, catering operation, or food service establishment, this strong, versatile cart boasts a heavy-duty, welded construction that promises dependable use. Its top two shelves also feature raised rear and side edges to help keep the contents of the shelves from falling and causing a mess or potential breakage. With 12 1/2" between each shelf, it's easy to load and unload the cart with whatever you need to transport. Four 4" swivel casters ensure precise control and maneuverability throughout your facility. Its ABS handle not only aids in easy operation of the cart, but it also helps protect walls, doors, and other surfaces from incidental bumps during use. This cart is designed to withstand up to 500 lb. of weight distributed evenly among the three shelves. Overall User Rating: Vollrath 97140 Stainless Steel 3 Shelf Utility Cart - 39 1/2" x 21" x 33 1/4"
These utility carts are made of heavy duty stainless steel. Features 3 shelves for transporting all your items. Smooth rolling casters and heavy duty plastic handle make this a great cart for the price.